The new range follows the release of the Cheeseburger Pizza and The Meatfielder last year. 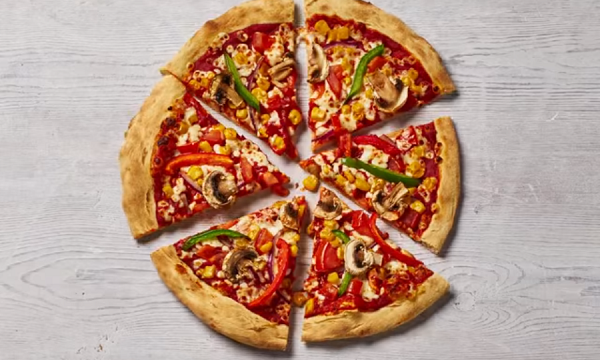 Domino’s has launched their new Delight pizza range, featuring the Delight Chicken pizza and Delight Vegi pizza that are both said to be under 650 kcal. The Delight Chicken consists of tomato sauce, reduced fat British mozzarella cheese, chicken breast, red and green peppers, red onions and tomatoes. Meanwhile, the Delight Vegi is also made up of tomato sauce, reduced fat British mozzarella cheese, red and green peppers, red onions and tomatoes with mushroom and sweetcorn. “New Year, New Domino’s range. What better way to lighten up the January Blues than with our delicious Delight pizzas? They’re everything that’s great about Domino’s and are less than 650 calories for a cheesy treat,” Ian Straughan, head of product development and innovation at Domino’s, said.